Happy Halloween (yesterday)!! I hope everyone had a spooky fun holiday and got to enjoy a little sugar without the guilt! My initial goal for these lollipop ghosts was to have them completed by October 30th; that would have been nicer than making them an hour before trick or treat on October 31st while cooking a festive dinner simultaneously, but such is life in a busy home! To accomplish the ghost assembly task under our new timeline, I had to recruit help. My husband was working on some scary decor for our trick or treat ‘hang out’ by the garage, but luckily my stepdaughter was available and willing to help…free of charge even! This is a perfect craft for your kids to help you with since it’s a simple process! 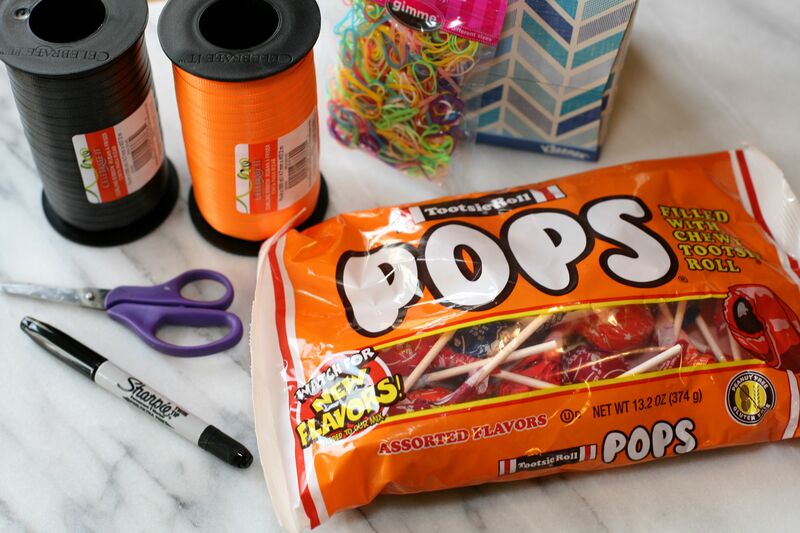 Below are the materials needed: black and orange curling ribbon, Kleenex tissues, mini-elastics (found in the hair accessories section of the store), tootsie pops, scissors and a black sharpie. Originally I wanted to use blow-pops as I’m not a huge fan of tootsie pops (isn’t the candy for the kids, Sara? ), but realized those wouldn’t work once I saw them at the store, because they have the wrapper twisted at the top and that could make some funny looking ghosts! After you have the materials gathered, prep the ribbon and tissues by cutting the ribbon in 18 inch lengths and cutting a handful of tissues into quarters. The quartered tissues come into play as the first step of assembly. 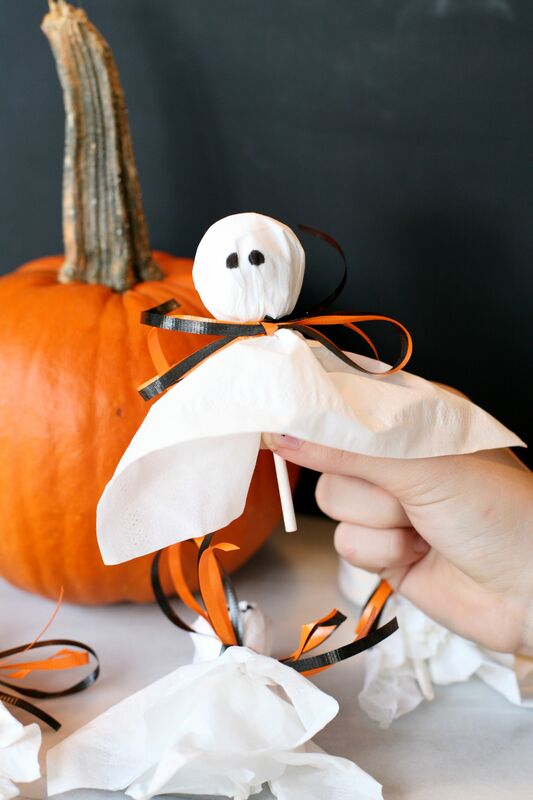 Next you’ll fold the tissue over the lollipop and secure it with one of the mini elastics. To hide the elastic, take one piece of black ribbon and one piece of orange ribbon and tie it around the ‘neck’ into a bow, just like your tying shoes strings. The final touch is two spooky eyes you’ll make with the black sharpie. Since you are writing on tissue the marker will bleed a little so add them by making dots and adding to it if you want them bigger after the color spreads. I’ll admit these ghosts might not be scary after all, but they are definitely cute and the little kids who came trick or treating loved them! Especially the ghost buster who came to our house 🙂 See below for a quick recap to make your own ghosts! Cut ribbon into 18 inch lengths. Take a few tissues and cut into quarters. Place one full tissue on the table and lay one quartered piece in the middle. 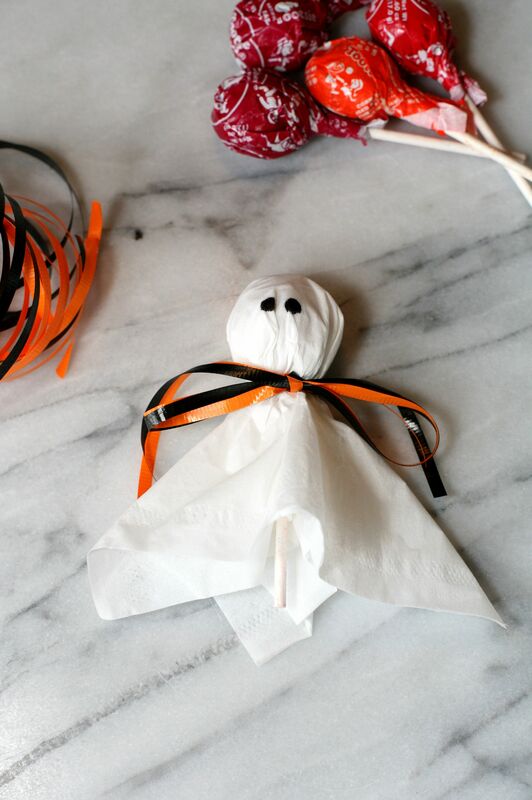 Place a lollipop over the tissues and fold the tissue over to make the ghost shape. Secure the tissue with a mini elastic and tie one piece of black ribbon with one piece of orange ribbon around the elastic, like your tying shoe laces. Complete the ghosts by making two eyes using the black sharpie.